Across from Corbyn Sands and the Grand Hotel on the seafront more graffiti. In fact between here and the Belgrave Road/Torbay Road intersection every single street box and litter bin has been vandalised. The more there is that is vandalised the more vandalism will occur in the immediate area and then spread. Graffiti attracts graffiti, as Torquay is now covered in it expect it to increase exponentially. 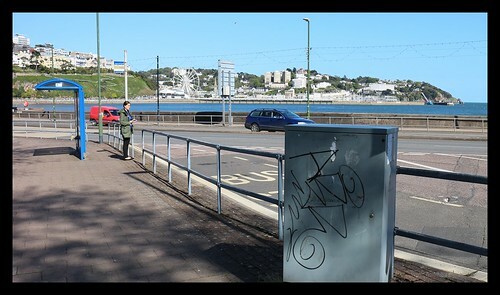 Looks like this was done by ABRO who also has been vandalising street signs and life buoys in the seafront area.